Manipur state film awards were distributed on Saturday at a glittering function held in Imphal. Prominent film maker and Director Makhonmani Mongsaba’s Nangna Kappa Pakchade (Tears of a Woman) and young and energetic documentary film Director Haobam Paban Kumar’s Loktak Lairembi (Lady of the Lake) bagged the best feature film titles for the 9th and 10th Manipur State Film awards. The 9th edition was for the year 2013-2014 and the 10th was for 2015-16. Nangna Kappa Pakchade is produced by Thouyangba Meetei and Th. Thoungamba Meetei while Phum Sang was produced by Haobam Paban Kumar himself. 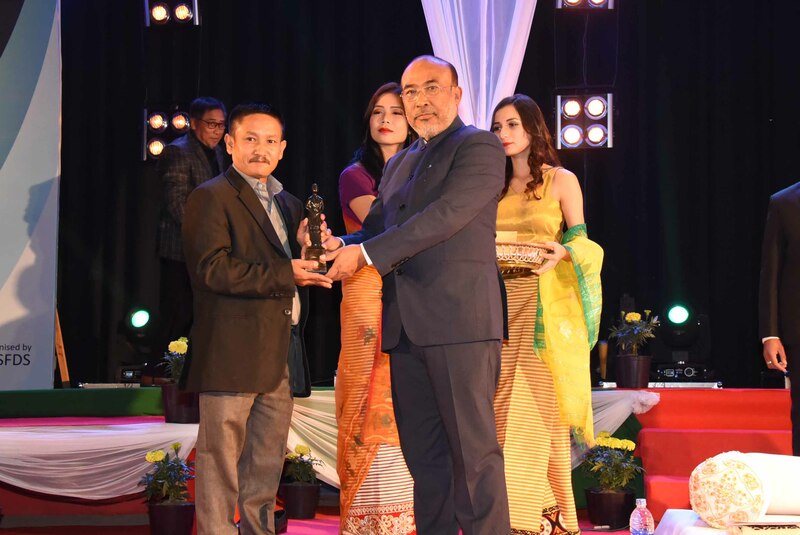 The awards were distributed during a colourful award distribution function held at the well decorated Manipur Film Development Society (MFDS) auditorium in Imphal on Saturday night. Manipur Chief Minister Nongthombam Biren Singh and Arts and Culture Minister Langpoklakpam Jayentakumar Singh were the main guests during the gathering. In the non-feature category, Phum Sang(Floating House) also directed by Haobam Paban Kumar and produced by Films Division got the best non-feature film for 9th edition while Ima Sabitri, directed by Bobo Khuraijam and produced by Gurumayum Ranita got the best non-feature film for 10th Manipur State Film award. Best actor for feature film category for 2013-2014 goes to RK Kaiku Singh for the role of Oja Chinglensana for the film Nongmatang and for 2015-16,Best Actress title goes to Tonthoi Leisangthem for the role of Nungsithoi for the film Nangna Kappa Pakchade while Th Khelemba Meetei got the best actor award for his role as Leirik for the movie Khujinda Yotpi. In best direction, Makhonmani Mongsaba won the award for his film Nangna Kappa Packchade for 9th edition and Maipaksana Haorongbam for Eibusu Yaohanbiyu for 10th edition. The Best film critic award of the 9th and 10th edition of the state film award was awarded to Herojit Nongmaithem and Bobby Wahengbam respectively. MFDS lifetime achievement award title goes to Lourembam Pishak Devi while veteran artiste Oinam Biramangol Singh was conferred Lifetime Achievement Awards for his contribution towards Manipuri Cinema. Mentioning that the State has huge potential and talents in the field of Cinema however there are less number of people who give due recognition, appreciation and support those who work hard in such fields, while addressing the award distribution function, Chief Minister Biren said that the government is working out a Welfare Policy for better livelihood, to uplift the living standards and welfare of the performing artists and their families in the State. In Presidential speech, Minister for Art and Culture L Jayantakumar Singh said that the journey of Manipuri films is just a beginning but it has brought many laurels of the State in both National and International platforms in such as short span. He announced that MSFDS would be screening films from various states and countries on every Saturdays and Sundays for the film lovers of the state soon.